Marco Arment may have helped develop the microblogging service Tumblr (currently owned by Yahoo) and gone on to create the read-it-later service Instapaper and the biweekly electronic publication The Magazine, but in the last few years he has become most famous for his podcasts: first the now-retired Build and Analyze with co-host Dan Benjamin and now Accidental Tech Podcast with co-hosts John Siracusa and Casey Liss. It was only natural that fans of his podcasts — yours truly included — bugged Arment to build a podcast app of his own. (I’ll cop to being obsessive about podcast clients. See “Five Alternatives to Apple’s Podcasts App,” 22 December 2012, and “Instacast for Mac Fills the Desktop Podcatcher Gap,” 31 May 2013.) But what we didn’t know was that Arment was already working on one, and had been since October 2012. After selling off Instapaper to Betaworks (see “Betaworks Takes over Instapaper,” 25 April 2013) and The Magazine to our own Glenn Fleishman (see “Glenn Fleishman Buys The Magazine from Marco Arment,” 29 May 2013), Arment had freed up the time to develop it, announcing Overcast in September 2013 at the XOXO Festival. It’s now available for free for iPhone in the App Store, with an optional $4.99 in-app purchase. Overcast may be the most hyped podcast client ever, but Arment isn’t seeking to revolutionize podcasting. Rather, he created Overcast to satisfy his own podcast listening needs. If it happens to work for you as well, all the better. Arment freely admits that Overcast may not be for everyone, even going so far as to link to other podcast clients in his app’s settings. That said, Overcast brings a number of welcome refinements to the podcast listening experience, along with a nicely designed user interface that makes it easy to control without requiring much visual attention. Server-side Sync — Podcast clients are, at their core, RSS clients. The way most work is by checking each subscribed feed, one at a time, at a set interval. While obvious, this approach is woefully inefficient, as the client must connect to a different server to get new episodes of each podcast. To reduce this unnecessary work, Overcast borrows a feature from Shifty Jelly’s Pocket Casts, instead relying on a single server to aggregate and cache new podcast episodes (Arment had help from Shifty Jelly’s Russell Ivanovic in developing Overcast). Although this approach requires you to create a free account before using Overcast, it enables Overcast to use less battery power and receive new episodes faster than many other podcast clients. For instance, in my testing, Overcast typically received a new podcast episode 30 minutes before Instacast. Proper Playlists — One podcast client feature I almost always ignore is playlists. In theory, they’re great for grouping podcasts on similar topics so you can listen to a bunch of related episodes, one after another, without fussing with your iPhone in the car. Alas, in practice, playlists are either buried deeply in the interface or are too difficult to manage. Overcast has the first podcast playlist system I feel inclined to use, thanks to easy access, well-considered options, and the capability to rearrange episodes manually. Playlists appear on the main screen, alongside individual subscriptions, so they’re easy to find, and they’re just as easy to create and manage. To create a new playlist, tap the Add Playlist button, the third button from the left at the top of the screen. Give the playlist a name, then select which podcasts to include (or exclude), as well as other episodes to include or exclude individually. 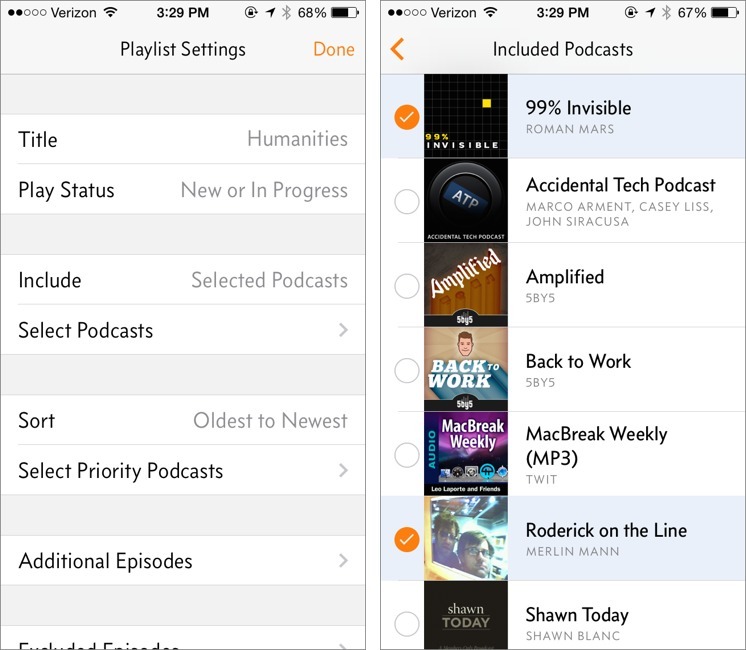 You can also choose how to sort podcasts and select podcasts to prioritize in the playback order. But what I most like about how Overcast does playlists is that, while a playlist is selected, you can tap edit in the upper-right of the screen and manually rearrange episodes to your liking. The free version of Overcast allows only a single playlist that displays the top five episodes. Full playlist functionality requires the $4.99 in-app purchase. Here’s a bonus feature. With playlists and subscriptions taking up the main screen, you may wonder how you can tell what’s playing at the moment. To help make it obvious, Arment has placed a neat waveform animation over the currently playing playlist or show. You can also see that animation on the playback screen, at the bottom of the show art. Smart Speed and Voice Boost — Perhaps the only downside of trading my day job and 100 mile commute for working at home on TidBITS is that I don’t have nearly as much time to listen to podcasts. That’s why I appreciate Overcast’s Smart Speed feature. Overcast, like most podcast clients, can be set to speed up playback, but this makes your favorite podcast hosts sound like chipmunks. 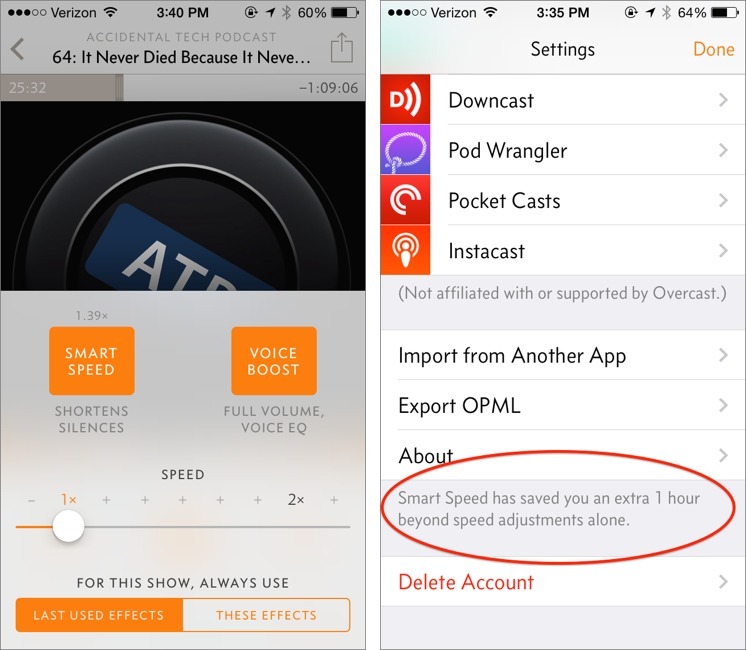 Overcast’s Smart Speed feature instead shortens silences, reducing playback time without any noticeable difference in audio quality. I was initially dubious that this could save much time, but it turns out to be a surprising amount. To make sure you realize what it’s doing, Overcast reports on how much silence it has skipped in the Settings menu. In the past week or so, even without listening to too many shows, I’ve saved an hour, which is significant. Being able to listen to more podcasts in less time with no drawbacks in audio quality is a killer feature. But just as good is Overcast’s Voice Boost audio effect, which is an equalizer that highlights vocals. It makes a huge difference when listening over teeny iPhone speakers. Smart Speed and Voice Boost require the $4.99 in-app purchase, though you can try both for five minutes without charge. Recommendations from Twitter — If you tap the Add Podcast button in the top-right corner, you’ll see the standard searchable podcast directory that’s in every podcast app these days, highlighting some of Arment’s favorites. But if you link up your Twitter account, you’ll see a Recommendations from Twitter category at the top, with episodes and shows tweeted about by those you follow on Twitter. This is a great way not only to discover new podcasts, but also to discover great individual episodes. I’d love to see a future update that includes curated playlists, like Beats Music, with collections of recommended episodes from individual contributors. 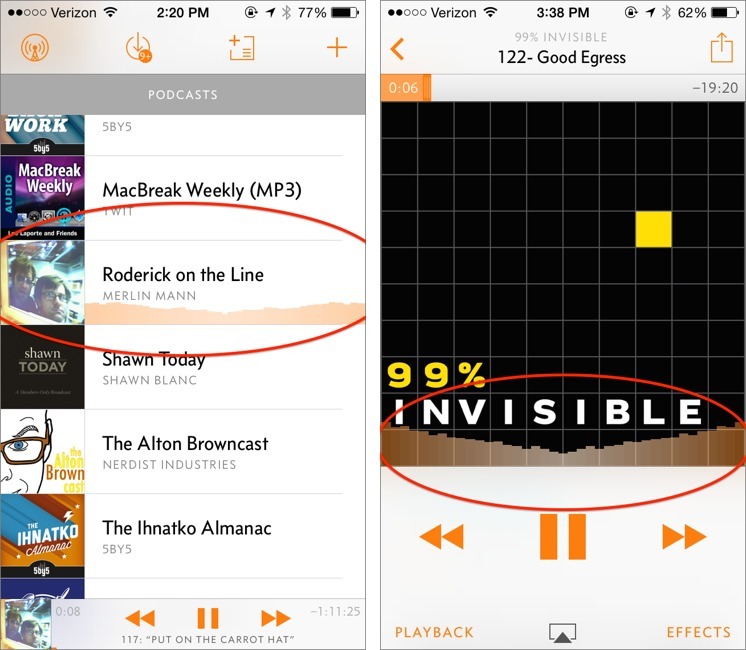 But It’s Not for Everyone — What’s not to like about Overcast? 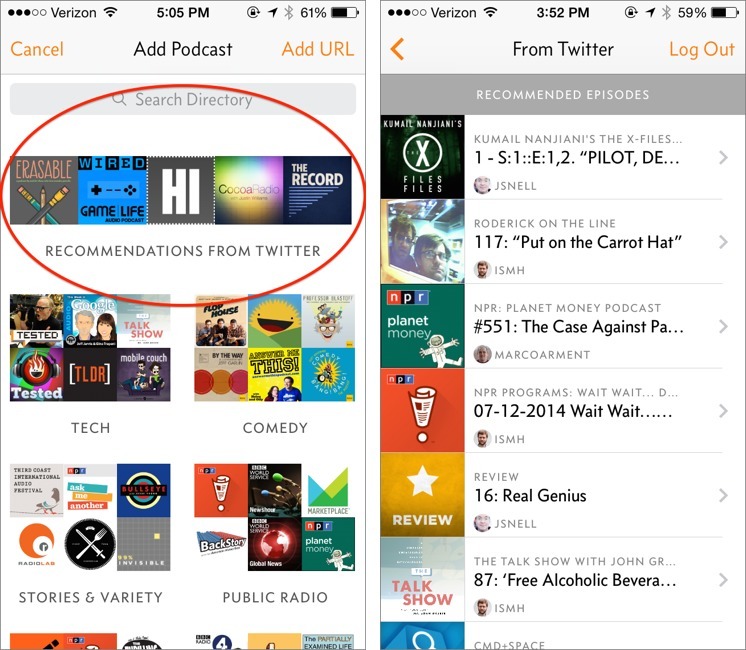 People have different desires when it comes to podcasts, which is why there are so many clients in the App Store. 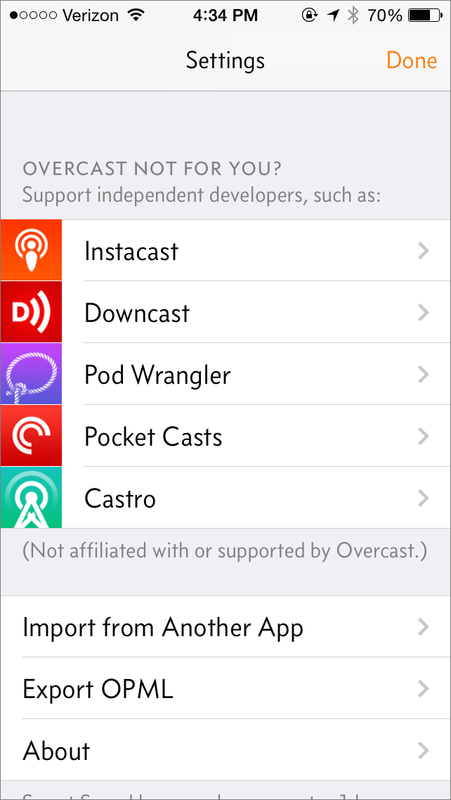 Unfortunately for me, Overcast lacks a few features that prevent it from replacing Instacast as my client of choice. Overcast doesn’t do streaming at all. An episode can’t be played back until it has been downloaded. I understand why Arment chose to leave this out, as streaming is finicky and tough to get right. If you often listen to podcasts while on the road, downloads are better, since playback can stop (or do stranger things) when you pass through an area with poor cellular connectivity. But for someone like me who is often at home, streaming is preferable, since I don’t have to waste bandwidth and storage space automatically downloading episodes I may or may not listen to. That leads to my next complaint, which is that Overcast, unlike Instacast, can’t limit how much storage it uses. While Overcast does warn you when your iPhone’s free space falls under 200 MB, it happily keeps downloading podcasts until your iPhone is full. To manage storage, Overcast provides only a limited set of tools: you can unsubscribe from shows, change how many to keep (two by default), or delete episodes manually. In a way, Overcast forces you to choose which shows you’ll actually listen to, instead of my inefficient method of subscribing to 40 podcasts and listening to only a handful. 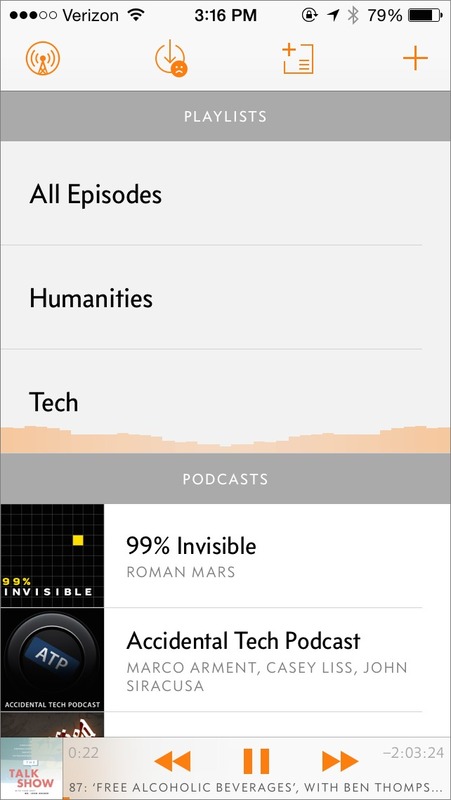 Perhaps a future version of Overcast could suggest shows to drop, based on how little the user listens to them? My final problem with Overcast is that it’s mostly tied to the iPhone. I prefer listening to podcasts from my Mac, so I don’t miss any notifications or system sounds while using earphones. Also, a Mac app could provide keyboard shortcuts for faster interaction than is possible on the iPhone. Arment has a rudimentary Web app available, but it offers bare-bones functionality. An iPad app is in the planning stages, and he’s considering creating a Mac app in the future. Who Is Overcast For? — I’m sad that Overcast isn’t for me, because it’s a beautifully designed podcast client with numerous well-considered features. But I fully accept that I am now an unusual podcast listener, given that I rarely leave the house. Most people listen to podcasts while on the go — commuting, walking the dog, or running — and for those folks, Overcast is a great client. When I was listening to podcasts while driving, I would have especially appreciated Overcast’s oversized playback buttons, which are handy when you need to play or pause an episode with a minimum of eye contact. Voice Boost would also have been handy when my cantankerous Bluetooth FM transmitter flaked out. If you’re unsatisfied with the current slew of podcast clients, try the free version of Overcast to see if it’s right for you. If not, you can always check out one of the other podcast clients that Overcast itself recommends — they’re all pretty good. I'm giving Overcast a go. I currently use Downcast. 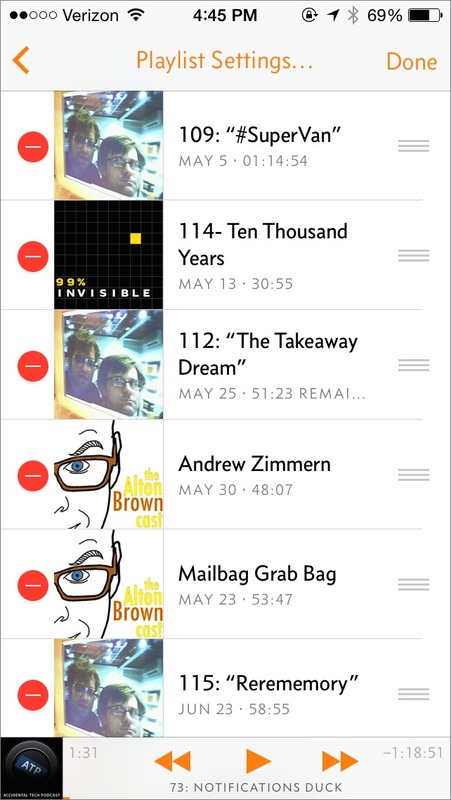 One feature I miss in Overcast is the ability to mark an episode as "read" either from within the play screen (so it goes to the next episode) or from within a playlist listing. Perhaps I'm not looking at the right place. Same here. I bought the IAP but co t find an easy way to delete a podcast mid-listen and skip to the next. I've gone back to Downcast. This is a critical feature for a client used while driving. With Downcast I simply swipe down to delete and skip...easily done with iPhone in mount on dashboard without taken eyes of the road. I've had a few issues with the app so far, but that's not a deal-killer in itself for a just-released product. Upon exporting my podcast list from Downcast I got an error, but after 20 minutes everything seemed to have propagated to the website account and the iPhone app. But it's a bit of a jumble, organized on the site by date, oldest first, so that the 1st 'Active Episode' is from October 2012 (a discontinued podcast I keep in Downcast for when I want to sample old episodes), so I'd have to scroll down every time I want to see the most recently updated podcasts. On the app itself I don't understand HOW it's organized. In Downcast I have around 200 podcasts (some discontinued, some sporadic), most of which I do not listen to regularly. In that app I can set podcasts to 'Refresh but don't download' so that I can see when new podcasts arrive, then decide based on the topic or guests whether I want to download it. I do not see how I can do that with Overcast. Here's an unmentioned feature that I'll be considering while considering Instacast, Downcast, Pocket Casts, and Ecoute: managing my iPod nano's podcasts at the same time that I manage podcasts on my iPhone. I really want to like this app, but the inability, to play video, and the developer not pursuing that feature kills this for me. Yep, if you want video, move along. Marco has said he doesn't watch podcasts and his custom playback engine is an audio engine, not a video one, so it is highly unlikely there will ever be video in Overcast. I know there are some people who watch podcasts, but it does seem it is a very small percentage. There have been times I've had to download a video podcast, but I still only listened to the audio. Even the Apple Keynotes I rarely am watching my the screen. For video, I find Downcast on the iPad to be the best of the lot, and it even will speed up the video just like the audio. I suspect this looks weird, but like I said, I'm not watching the screen anyway. The speed up button on a podcast player should never change the pitch of the voices. iOS is extremely smart about this and I normally listen to all podcasts at somewhere between 1.5x and 3x. Certainly in Downcast and Podcast the pitch doesn't change. The said, Overcast's speed boost is still better. I got through the three hours of The Talk Show this week in just over 1:10 thanks to speed boost even though I was "only" on 2x speed. I've switched from Downcast to Overcast and so far I'm not looking back at all. Streaming isn't an issue for me since with background downloading, I have the podcast by the time I want to listen to it.